Science is something that kids can either be interested in or find to be boring. One thing that may make it boring is that science can be quite too complex for kids to understand at times. But make it fun and entertaining and kids will get quite interested with what science can offer. Give kids something interesting to do with science and they would be attracted to knowing about it more. That is why a book like the Junk Drawer Physics may just be what kids would need to nurture their interest in science. 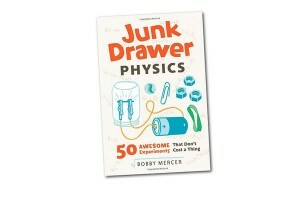 The Junk Drawer Physics is a book that helps children understand physics through experiments. What is remarkable with it is that the book teaches kids experiments using objects that they can supposedly get from the junk drawer. Fifty crazy experiments teach kids about physics using objects they can usually find at home. These experiments teach kids about cool concepts such as motion, energy, sound, light, electricity, magnetism and more. Each experiment comes with a list of materials needed as well as step-by-step instructions on what to do. Scientific explanations go with each experiment to enlighten kids on what happens during each experiment. The Junk Drawer Physics is ideal for kids from 9 years old and above who are interested about physics. It is available at Fat Brain Toys for $15.